The Mayan astrology compatibility calculator predicts how good or bad your relationship will be based on the Tzolkin calendar signs. This love test shows you what your relationships are made of when it comes to Mayan zodiac signs and gives you deep insight into your compatibility with your partner. How does one find Mayan Compatibility? Give yourself a chance to discover the possibilities in love starting with this simple free Maya horoscope compatibility calculator. Once you understand yourself better through your star signs in astrology and with a different perspective from Mayan astrology, you can then understand love much better. The Mayan zodiac is very unique. Some people have not even heard of it. This is because it is a very rare mystical knowledge that was once very hard to understand. Now it is simple to understand it. Thanks to all the people for the past thousand years who have studied it and mapped it out. This is the day of the wonderful Internet and the calculations of computers. 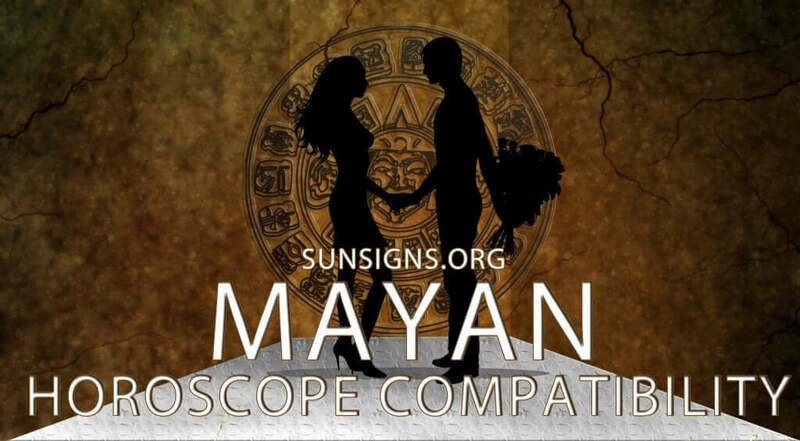 You can now discover the secrets of Mayan astrology compatibility within only a minute. The Mayan calendar uses 20 different glyphs to represent the days and this is in combination of 13 galactic numbers which makes a totally of 260 unique signs which is more complex than the 12 signs of the Chinese zodiac of western astrology. This system is a rare gem indeed. Red Dragon, White Wind. Blue Night, Yellow Seed, Red Serpent, White Worldbridger, Blue Hand, Yellow Star, Red Moon, White Dog, Blue Monkey, Yellow Human, Red Skywalker, White Wizard, Blue Eagle, Yellow Warrior, Red Earth, White Mirror, Blue Storm, Yellow Sun. Magnetic, Lunar, Electric, Self-Existing, Overtone, Rhythmic, Resonant, Galactic, Solar, Planetary, Spectral, Crystal, Cosmic. Learn more about yourself and your chosen love with this free Mayan Astrology Compatibility Report that will give you a an excellent love prediction.